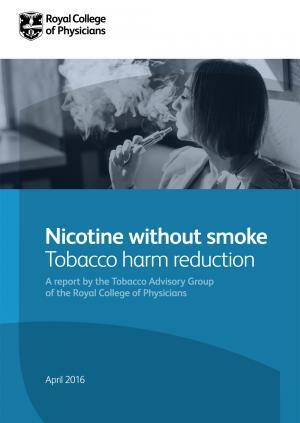 This report provides an update on the use of harm reduction in tobacco smoking, in relation to all non-tobacco nicotine products but particularly e-cigarettes. It shows that, for all the potential risks involved, harm reduction has huge potential to prevent death and disability from tobacco use, and to hasten our progress to a tobacco-free society. Provision of the nicotine that smokers are addicted to without the harmful components of tobacco smoke can prevent most of the harm from smoking. Nicotine replacement therapy (NRT) is most effective in helping people to stop smoking when used together with health professional input and support, but much less so when used on its own. E-cigarettes appear to be effective when used by smokers as an aid to quitting smoking. E-cigarettes are not currently made to medicines standards and are probably more hazardous than NRT. However, the hazard to health arising from long-term vapour inhalation from the e-cigarettes available today is unlikely to exceed 5% of the harm from smoking tobacco. There are concerns that e-cigarettes will increase tobacco smoking by renormalising the act of smoking, acting as a gateway to smoking in young people, and being used for temporary, not permanent, abstinence from smoking. However, the available evidence to date indicates that e-cigarettes are being used almost exclusively as safer alternatives to smoked tobacco, by confirmed smokers who are trying to reduce harm to themselves or others from smoking, or to quit smoking completely. There is a need for regulation to reduce direct and indirect adverse effects of e-cigarette use, but this regulation should not be allowed significantly to inhibit the development and use of harm-reduction products by smokers.